National elections sorted into two types, one with higher levels of turnout and a pronounced shift to one party. Yes, you might have thought that political science had left theories of “realigning elections” behind. But as the 2010 midterms approach, talk of “wave elections” seems to be all the rage, and the concept—though understandably fuzzy—has strong parallels with the electoral realignments of days past. So let’s put the idea to a few empirical tests. One claim embedded in the “wave” thinking is that Congressional (or perhaps midterm) elections come in two types: those occasional elections that reflect dramatic shifts in partisan preferences, and the majority of elections that do not. If we look at the distribution of changes in average Congressional support for the Democratic candidate from election to election, the wave-based approach leads us to expect that there will be many small shifts punctuated by the occasional dramatic shift. Now, with only 19 observations on my computer, I’m not going to make any claims about the precise distribution of the changes in two-party support from election to election. 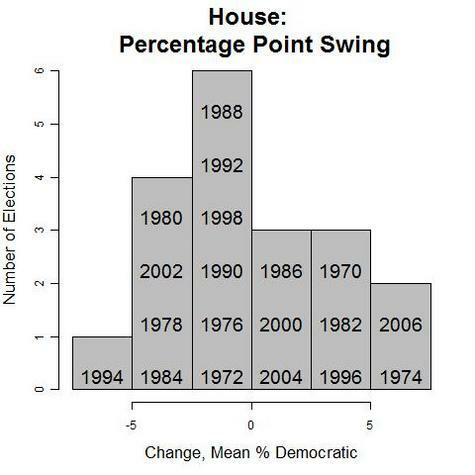 But we can calculate the change from the previous election, and use a histogram to present the observations. The key point here is a simple one: thinking of elections along a continuum seems to be more in keeping with the data than any binary concept of “waves.” The data themselves show no obvious cut-point between what constitutes a “wave” election and what does not. As an example, consider the 1982 election. Was 1982 a “wave,” with its shift of 4.5 percentage points in the average district vote toward the Democratic Party? If not, the reason is in part because the Democratic Party controlled the House of Representatives before the election, putting a ceiling on potential Republican loses. In 1982, the Republicans’ share of the two-party vote outside of the South was 43.9%, the lowest margin the GOP would win between 1974 and 2006. Another claim is that “wave” elections are nationalized, whereas the typical election is fought more on local issues. To look at that possibility, I borrowed district-level partisanship measures from Matthew Levendusky, Jeremy Pope, and Simon Jackman from the 1960s until 2000. These measures are purged of factors like incumbency and national-level swings. 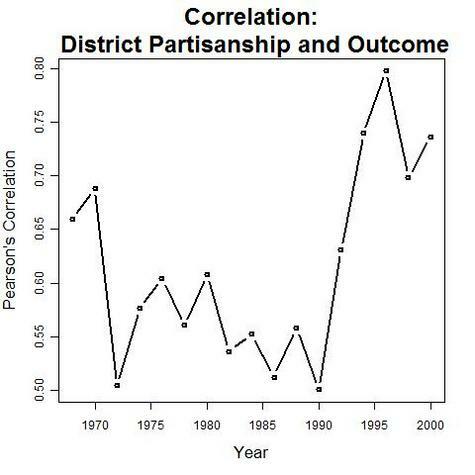 I then looked at the correlation between district-level partisanship and the Democrats’ share of the two-party House vote in each year. As elections are more nationalized, we might expect higher correlations between baseline partisanship and Congressional support. The understanding of 1994 as a nationalized election seems correct—that year was part of a dramatic upswing in the relationship between baseline partisanship and Congressional voting. But what is notable is that as the 1990s went on, that relationship remained stronger than in the prior decade. By this metric, 1996 was even more nationalized than was 1994. From these admittedly partial data, it seems that 1994 was not so much an outlier or a “wave” as it was the beginning of a newly nationalized era. There are a couple of interesting things about your graphs. In the upper graph, presidential elections cluster in the center (6 out of 9 elections in the two center columns vs. 3 out 8 in the outer four columns). Also, I think that it would be more interesting to compare midterms with the previous midterm (4 years earlier) because the presidential electorate is so much larger than the midterm electorate. The second graph is more evidence for an argument that I have been making for a long time. Namely that Perot was either a harbinger or cause of a realignment of American politics. Before Perot there were liberal Republicans and really right-wing Dems. Since Perot, not so much. Pardon me if this is a very basic question, but it’s the first time I see a histogram with the data embedded into it as in Fig. 1. How did you do it?